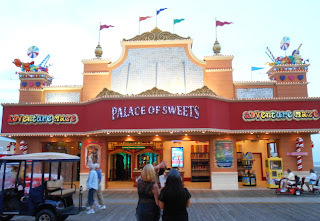 If you are looking for a little fun and got money to spend...you can check out the Palace of Sweets ~ Mirror Maze in Wildwood New Jersey. This mirror maze is located right on the Wildwood boardwalk and usually there are no long lines to wait in. Hubby and I paid the money (very expensive in our honest opinion and very over-priced) and went in through the mirror maze. We spent about 15 minutes in there, if that and found it to be pretty easy to get through. In hubby's opinion, too easy for the price we paid. The evening that we went in there were some kids in there messing around and the attendants didn't do anything about it so it kind of ruined our experience. With that said, we are glad that we did it as it was something that we wanted to do and finally did. However, we wouldn't do it again because we find it to be too pricey for what it is. Once we were done...we went to buy some candy (they are also a candy store) and decided to not do that because again...they were expensive. The candy looked delicious, but not worth the prices they were asking. If you are a couple doing this mirror maze...plan to spend over $22 for you both. I think for most families though, this would be an expensive family activity that only lasts for 15 to 25 minutes at most. You can find it on the boardwalk at 2701 Boardwalk Wildwood, NJ 08260. If you are looking for more family-friendly activities to do down in Wildwood New Jersey that are more affordable, you can find several great suggestions by visiting the New Jersey category here on my blog.